We’d love your help. Let us know what’s wrong with this preview of Moods of Future Joys by Alastair Humphreys. To ask other readers questions about Moods of Future Joys, please sign up. Having followed Alastair's blog and videos for some time I decided to read the books. I wasn't disappointed! He has a great writing style and I found it easy to keep turning pages. I've already started on the next one too! Harbouring a desire to ride round the world Alastair Humphreys had saved and planned it for ages, and at the age of 24 he was ready to leave. Or was he? Huge doubts had set in and he was worrying about all sorts of things, but he took the plunge and set off to the continent. As the days passed through Europe, confidence grew and after a couple of weeks cycling he was approaching Istanbul, and the prospect of leaving Europe and moving into Asia. Then the September 11th attacks happened. This chan Harbouring a desire to ride round the world Alastair Humphreys had saved and planned it for ages, and at the age of 24 he was ready to leave. Or was he? Huge doubts had set in and he was worrying about all sorts of things, but he took the plunge and set off to the continent. As the days passed through Europe, confidence grew and after a couple of weeks cycling he was approaching Istanbul, and the prospect of leaving Europe and moving into Asia. Then the September 11th attacks happened. This changed everything and made the route through Iran, and Afghanistan he’d had in mind, untenable. Instead he had to turn right and pedal through a tense middle east and head into the wild lands of Africa. This is a fantastic account of a journey Alastair Humphreys took from England, through Europe, and then on through Africa to Cape Town. It's not an encyclopedic account of his travels, but a rather fast paced clip of his ride, with impressions and his own personal struggles and fears. I found it hard to put down because it was very compelling for me. The only problem is the book itself. There are a number of places where sentences run together, due to the digital printing process perhaps, or slop This is a fantastic account of a journey Alastair Humphreys took from England, through Europe, and then on through Africa to Cape Town. It's not an encyclopedic account of his travels, but a rather fast paced clip of his ride, with impressions and his own personal struggles and fears. I found it hard to put down because it was very compelling for me. The only problem is the book itself. There are a number of places where sentences run together, due to the digital printing process perhaps, or slopping proofreading. This did not, however, ruin the enjoyment of the book, but someone reading this edition might want to keep it in mind. Good read. Amazing ride, and does have some good details about his journey. Pretty cool. Interesting to realize how challenging such a ride can be from a safety/security perspective....getting stoned in Africa, and then robbed (at least once?). Pretty cool inspiration. My first kindle book - from PWC. I bought this new, after acquiring the second volume of Alastair Humphreys' travelogue for nothing from Bookmooch some year ago and despairing of ever getting the first part. I read both together, but I can't do a joint review. Humphreys writes a strange travelogue, but a damned good one. He cycled round the world, solo, in his early 20s, taking over four years, on a budget of nothing but his hoarded £7000 of student grant. He did little in the way of preparation – he chose his route each day, picking a general direction, travelling city to city, in part according to where he could get visas to enter. Allegedly, he did it because he had nothing better to do and wanted to see if he could and if he could write. The answer is a definitive yes. He writes relatively little about where he goes or what he does, mostly generalities. This is far more a book about what it's like to ride around the world. Mostly he describes his feelings: his fears, his insecurities, his loneliness, his irritation at being asked the same questions over and over and over again. And he has many fears and insecurities: much of the first, slim book describes him crying himself to sleep, waking and crying, stopping and crying, wondering what the hell he is doing, and so on. In book one, he cycles from Yorkshire, around the near East and Fertile Crescent, over into Egypt and the length of Africa to the Cape. He strips his supplies to a level more basic than I can imagine - “I didn't take underwear. You don't need underwear.” He spends considerable wordage on how much he misses his girlfriend Sarah, who he left to do the trip... and a little on some of the attractive women he meets. By the end of Africa, he is a lean, sunburned, super-fit, veteran traveller, practised, polished and expert, with a completely clapped-out bike. He hitches a ride on a racing yacht to South America, and the story ends. It's a good read, despite small size it says a lot. I miss a technical issues, Al never says this or that broke, just after long time there is next to nothing working within his machine... I would like to trace the way it wears. But probably it was not so important and instead we have dramatic descriptions of authors urges to call his girlfriend who he decided to dump for a sake of the trip (this is more complicated, I am being sarcastic here). I suppose some pictures would improve the book, wel It's a good read, despite small size it says a lot. I miss a technical issues, Al never says this or that broke, just after long time there is next to nothing working within his machine... I would like to trace the way it wears. But probably it was not so important and instead we have dramatic descriptions of authors urges to call his girlfriend who he decided to dump for a sake of the trip (this is more complicated, I am being sarcastic here). I suppose some pictures would improve the book, well, we have photos of borders stamps, not very clear though... Al mentioned he took camera with him, so I would imagine he took some pictures... Were they that bad? I don't know. Al describes his adventures on the borders, but not all of them. I would like to see all of them. I haven't written anything that big, so I cannot really criticize too much. I appreciate the language which is not too difficult for me as English is my third language, but it is beautiful, descriptive and encouraging to read and develop. This book is a fun easy read which will inspire any would-be adventure travellers. Alastair is a likeable, genuine character and writes with much skill. I read the kindle version which appears to be published by Eye Books rather than self published as the earlier reviews seem to indicate the paperback was. However, it still lacks polish, and the frequency of punctuation mistakes and typos was a little infuriating, could do with another edit. This isn't reason enough not to read it however. The best cycle-touring book I've read so far. Well written, great stories and metaphysical thoughts, nice character evolution, nice rhythm, never fading adventures. Loved it! A pleasure to read. Quickly dispels any romantic notions of 'epic adventure' in favor of giving a more raw, genuine take on going against the grain. Having long distance cycled myself, I entered this book with an air of admiration before I'd even read a single word. I've a lot of respect for people who have a dream, and no matter how daring or unimaginable that dream is, they take a stand and do it! Most of us will never have the guts to stumble those steps and are tied down with relationships, emotional connections to people/places and have financial restrictions. This is the story of Alastair Humphreys' epic adventure cycling around the wo Having long distance cycled myself, I entered this book with an air of admiration before I'd even read a single word. I've a lot of respect for people who have a dream, and no matter how daring or unimaginable that dream is, they take a stand and do it! Most of us will never have the guts to stumble those steps and are tied down with relationships, emotional connections to people/places and have financial restrictions. This is the story of Alastair Humphreys' epic adventure cycling around the world and his expectations, experiences and attitude along the way. His journey is split into two volumes "Moods of Future Joys" and "Thunder and Sunshine". This is volume one and captures his travels South through England, East across the European Mainland, down through the Middle-East and South through Africa to Cape Point. Seriously, look at it on a map! Even this one leg of the journey is bloody impressive. It's a great quick read and really does give you a sense of spontaneity and adventure. If this doesn't make you want to grab your bike and your passport, nothing will. My only criticism about the book is this... and unfortunately for me it's a big one. People go on adventures around the world all the time and get faced with border restrictions, abuse, theft and corruption; a lot of the time forcing them to take alternative routes or miss out segments of their journey. It can't be helped. In this book there is a 60 km section where Humphreys hitches a ride to a nearby town, not to escape danger or any of the other reasons above, but because he didn't want to miss a world cup match. Seriously, you have to be f*cking kidding me! You jeopardised your entire cycling expedition for a football match? I admire his honesty for owning up to it, as I believe he could have kept quiet and none of us would have known better, but I was still furious. I felt cheated and wanted to throw the book at the wall. Unfortunately, no matter how hard you've cycled or how many months you've grafted at the pedals, if there is a section of land you did not cycle then you haven't cycled around the world. It seems harsh, I know, but it's fact and that's just how it is. That is the reason I have marked down this book. To put all that effort in and put yourself through such torture just to break the main objective of the journey is bonkers. Grrr. Having said that, I've read a few travel books over the years and always find the authors a bit pompous and arrogant. You know, typical English man in a poor country turning his nose up at everything kind of behaviours. I found Humphreys to be very open minded and respectful to his surroundings and the people he encountered. It was very pleasant and reassuring to know that there's been someone out in the world showing everyone that we're not all complete d*ckheads. Read this book. It was truly an amazing journey. No other words are necessary. I finished reading this book and I'm already excited to read part two. This man biked around the world in this first book is his journey through Europe, the Middle East and Africa. I can't wait to read about his journey through the rest of the world. I liked both books of Alastair's cycling around the world but perhaps I had even higher expectations after reading couple of his other books beforehand. It must be extremely tough to summarize such a trip into two books, what to include in and what to leave out. Anyway mad respect for Alastair for completeting such a challenge! The first third or so of his trip through Europe, Middle East and Africa. Wonderful to watch his anxiety slowly fall away and to fall in love what he's doing for itself rather than just as an escape from home. May we all be this brave. Brilliant! The first in the two-part series on his global round-trip. It really feels like if you are there yourself. Armchair travelling of the first order! Really enjoyed this book, an honest and inspiring account of an incredible achievement. Emotional and inspirational read. One of the first books I have read as an adult. At the age of 24, Alastair decides his life in England isn't enough. He leaves a decent job, a loving family and girlfriend and his comfort zone to take on a hugely ambitious journey - to cycle around the world. He leaves his home county of Yorkshire in the summer of 2001 and sets off across the European continent. By the time he is approaching Istanbul, 9/11 has happened and he has to drastically reroute, avoiding Pakistan and Afghanistan. He turns right and heads down through the Arabian penin At the age of 24, Alastair decides his life in England isn't enough. He leaves a decent job, a loving family and girlfriend and his comfort zone to take on a hugely ambitious journey - to cycle around the world. He leaves his home county of Yorkshire in the summer of 2001 and sets off across the European continent. By the time he is approaching Istanbul, 9/11 has happened and he has to drastically reroute, avoiding Pakistan and Afghanistan. He turns right and heads down through the Arabian peninsula and into North Africa. After cycling through Sudan, Ethiopia, Kenya, Tanzania, Mozambique, Zimbabwe and Lesotho he makes his away across to Cape Town. Moods of Future Joys, as the rest of the title suggests, is simply the first leg of his mammoth undertaking. Alastair Humphreys is quickly becoming an idol for me. His writing, sense of adventure, stoicism to ride as self-sufficiently as possible and his general thoughts on life in the UK and Africa are all things I aspire to. Many of his innermost thoughts leak through the pages of this book and I found it surprisingly easy to relate to them. Having a travelled and adventured a little (but very little in comparison to Alastair), I empathised with his sense of disillusionment with the Western world and his need to get out there and experience life. Like many others of my 21st century post-globalisation western world peers, I have an itch that is almost impossible to scratch. Alastair's attitude towards his ride, the reasons for doing it and his descriptions of life on the road encapsulates what I think travel and, I suppose, life more generally, should be about. I really enjoyed the author's use of quotations and references to other literature. His revelations on how it felt to journey through Africa and the different attitudes and nature of the people he met there were particularly insightful. He has a writing style which flows easily and naturally and it makes for a gripping read. I liked his comment towards the end of the book that he would use the time on the ride to try to condense his feelings on a particular place or country into a few sentences. Of particular interest for me were his sentiments on aid that has been given to countries such as Ethiopia. Alastair commented that the villages he cycled through and was pestered for money, was subject to stone throwing and was treated with hostility had a direct positive correlation with those villages that had received aid. A definite sense of giving a man a fish rather than teaching him how to fish. Africa is a conundrum. If this book doesn't inspire adventure, I don't know what will. Loved this book, inspiring and motivational (although Alastair Humphries does seem to cry regularly!). Alastair Humphreys has such a beautiful, fluent style of writing that he could keep a reader entertained with a story that analyses the process of photosynthesis. It goes without saying then, that Humphreys writing about his round-the-world Odyssey makes for quite an enthralling read. This book could quite easily be knocked off in a few hours but it packs a punch for a rather small read. Jam-packed with action, romance, humour and of course, adventure, it gives a real insight into the emotional Alastair Humphreys has such a beautiful, fluent style of writing that he could keep a reader entertained with a story that analyses the process of photosynthesis. It goes without saying then, that Humphreys writing about his round-the-world Odyssey makes for quite an enthralling read. This book could quite easily be knocked off in a few hours but it packs a punch for a rather small read. Jam-packed with action, romance, humour and of course, adventure, it gives a real insight into the emotional ups and downs of such a long and arduous journey. 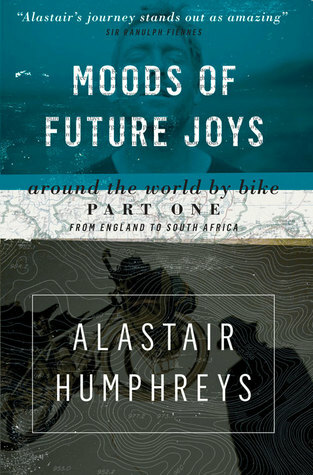 "Moods of Future Joys" is part 1 of Humphreys' story and this book details the section of his journey between leaving his home in the UK and pedalling the Middle East and Africa, through developing countries, to Cape Town, South Africa. His view of some of these countries sheds a light into the different cultures and gives the reader a whole new conception compared to what today's society thinks of such places. having just returned from riding 3000 miles in the US, i thought this would be a good thing to read... there are plenty of things i totally recognize and even wrote about myself. foremost, meeting wonderful people and "rough camping" as humphreys calls it (i use the term stealth camping that i heard somewhere). both of those experiences i share very similar emotions. the one thing, i didn't experience, perhaps because i was not riding around the world and in such impoverished countries, his seve having just returned from riding 3000 miles in the US, i thought this would be a good thing to read... there are plenty of things i totally recognize and even wrote about myself. foremost, meeting wonderful people and "rough camping" as humphreys calls it (i use the term stealth camping that i heard somewhere). both of those experiences i share very similar emotions. the one thing, i didn't experience, perhaps because i was not riding around the world and in such impoverished countries, his severe angst of failure. my last ride (my third 3000-ish mile ride) was exactly the opposite, in that at 60 and just retired, i was free to travel. my wife said as long as i got home in time to put the garden to bed i should go. humphreys struggle with riding away from all that he knew and loved was nearly overwhelming. his writing about that seemed to be somewhat superficial though and i kept hoping he would go beyond mentioning how much he cried about it. This is the book that played a large part in prompting me, for better or worse, to hit the road myself for a bicycle journey lasting several years. Even in the current glut of self-published monologues about long and tedious transcontinental rides, it remains a leading example in the genre. A generous amount of thoughtful, relatable introspection makes it compelling reading for those more interested in motivation and getting the most out of life, as well as those into their travel tales and bicy This is the book that played a large part in prompting me, for better or worse, to hit the road myself for a bicycle journey lasting several years. Even in the current glut of self-published monologues about long and tedious transcontinental rides, it remains a leading example in the genre. A generous amount of thoughtful, relatable introspection makes it compelling reading for those more interested in motivation and getting the most out of life, as well as those into their travel tales and bicycle travel literature. And the genuine impressiveness of the journey itself and the hardships undertaken more than justify its existence on the bookshelf. I like Alstair, I admire him. He biked around the world using half as much money per day…no less, than I did when I crossed Latin America. He had bad equipment, as shown by his frequent breakdowns of his wheels. I want to only praise him for his accomplishment and for his ability to bike around the world and then sit down and write the book. Alstair is not a gifted writer. But who is? Why should books be reserved for writers to write? This book does not deserve five stars. But it gets it anyway I like Alstair, I admire him. He biked around the world using half as much money per day…no less, than I did when I crossed Latin America. He had bad equipment, as shown by his frequent breakdowns of his wheels. I want to only praise him for his accomplishment and for his ability to bike around the world and then sit down and write the book. This book does not deserve five stars. But it gets it anyway because it is a book about biking around the world. Also, I did not expect my copy to be signed when I ordered it! Photos. Photos would have been nice.